My desk is covered in glitter after my last craft session making a card inspired by Jennifer´s Glitter window card from day three of Clear & sheer class! As I didn´t have a pattern die or a suitable word die I made my glitter window like more of a background using two colors, bright green and aqua. I didn´t have a bigger piece of double sided tape either, so I had to put strips of double sided tape close together on a 4x4" piece of acetate. I then pulled the release paper of two strips at a time, put on green glitter, rubbed it gently down on to the double sided tape, and then I did the same with the aqua glitter, taking turns until I had covered the acetate in glitter! I love this happy stamp "Suzette", by Moonlight Whisper and Kraftin´Kimmie Stamps. When I use her on a card I almost always put a ton of glitter glue on her dress and no exception today, as I wanted her to glitter as much as the background! The sentiment stamp "Don´t let anyone ever dull your sparkle", by KaiserCraft was perfect for this card! Day four of Clear & sheer class and I decided to give stamping-on-acetate a try. Inspired by Debby´s card I used the same flower stamp "Large flower background", by Hero Arts, that I used on my Hello Vellum card, first day of class. I stamped the image twice, on acetate using black Staz On ink and on watercolor paper using a light brown pigment ink so I barely could see the stamped image, I just wanted guide lines where to color, I did the coloring using Inktense pencils, water and a brush. Very quickly and not very precise. When both of the stamped images had dried I assembled them. I also wanted to try Jennifer´s tips from yesterday, to heat emboss a die cut word several times, a really cool technique! Clear & sheer, day 3... acetate techniques... I decided to make an acetate mini tag. It took me forever but I am pretty happy with the result! I made the tag out of two pieces of acetate attaching different elements on each of them. For the actual tag I used a creative cut die, "Embellished tag", by Mama Elephant. The little critters, (penguins, I guess!) are also by Mama Elephant, from the clear stamp set "Love quotes". For the grassy little hill I used a border die, "Landscape trio", by Mama Elephant too! I did attach pieces of cardstock to the back of each element, but it really didn´t bother me seing the strips of double sided tape and Copic color through the acetate. But it´s a great place to write a little message, on the backside of the hill! The Happy birthday sentiment is from the clear stamp set; "À la mode, Birthday girl", by My Favorite Things. I punched a hole through the tags and joined them together with a string of twine, ready to be attached to a gift or a bouquet of flowers! You´re my cup of tea! I have made yet another card with inspiration from the clear & sheer class, day 2. And yes, this kind of card is more my cup of tea! I made a very clean & simple card where I have taken a piece of vellum to create a soft and sheer background as you can see the pattern paper through it , as I didn´t want the adhesive to show, I put double sided tape on the back of the image, I put a small glue dot underneath the vellum where the diamonds are placed and the sentiment strip also holds the vellum in place with double sided tape! The image on this card is a stamp called "you are my cup of tea", by My Favorite Things. I paper pieced the tea cup and colored the rest of the image with Copic markers. I also added a cute red heart on the paper tag hanging from the teabag! Todays card was a bit of a challenge as I felt totally out of my comfort zone on this one! But I guess thats a good thing, to think outside the box sometimes! I chose to make a background panel using dye inks on vellum. At first I was not sure if I had any dye inks at all, but going through my box of inks I found three odd colors! A blue-ish, a yellow/green-ish and a grey. The inks blended well together and I like the sheer and smooth look of the vellum. I then heat embossed butterflies on top of the dye inked background, using embossing powder in gold. I also heat embossed a sentiment on a strip of cardstock to add on the left side of the card. I attached the vellum on to a blue panel of cardstock and then attached that on to a piece of glitter paper to get some shimmering gold on the card! I finally decided to embellished it with some pearls. I am taking the new "Clear & Sheer" class over at Online Card Classes. I am pretty excited as it´s all about vellum and acetate and this is something I have not been using very often (or maybe ever). So this is my first card using vellum. I took inspiration from class and heat embossed a flower stamp image, "Large flower background", by Hero Arts on a watercolor paper. I colored it with Inktense pencils, I almost always do all my coloring using Copics so this whole card has been all about using "new" and different techniques! I didn´t color all of the image, I like that you can see the heat embossed shimmer in the background. On my strip of vellum I heat embossed the hello sentiment from the clear stamp set "Oh yeah", by Avery Elle, using embossing powder in color magenta, by Ranger. I attached the strip of vellum on the back of the panel. I inked the edges for a softer look and added some sequins! 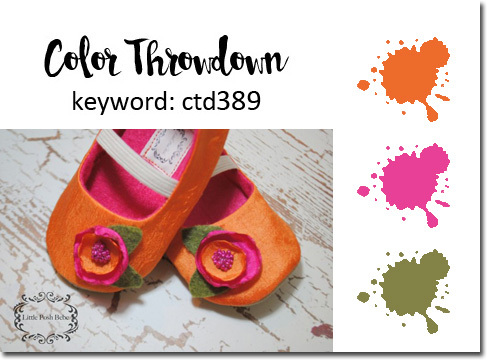 I have been meaning to participate in the Color Throwdown challenge for weeks, just to discover that I was too late, the challenges had already closed. But this week I was on time, a few days ahead too! This is my entry! The color combination for this weeks challenge was perfect! I love this combo of orange, fuchsia and green! And I have had these little guys in the back of my mind for quite a while! The alligator and the giraffe are from the clear stamp set "Zoo Crew", by Paper Smooches. The balloon is a part of the stamp "Balloon Bunny", by Lili of The Valley. I wanted the balloons to glitter and sparkle. First I added a coat of Glossy Accents to the balloons and as it was still wet I sprinkled some glitter on them. I let it dry before I added another coat of Glossy Accents to get the surface of the balloons soft and shiny! All images are colored with Copic markers! Pyssloteket har just nu en rolig tävling, temat är vår och den här moodboarden att inspireras av. Man kan lämna ett bidrag i form av ett kort, en layout eller ett PL-uppslag. Pyssloteket has a fun challenge/contest, the theme is spring, and this is the mood board to be inspired by, to make a card, a layout or PL page. Jag har gjort ett kort och här är mitt bidrag! Jag inspirerades av den turkosa cykeln och de rosa blommorna. I made a card and here is my entry! I was inspired by the turquoise bike and the pink spring flowers. Stämpeln är från Moonlight Whisper och är en av tre i setet "Going places", från Kraftin´ Kimmie Stamps. This stamp is by Moonlight Whisper, one of three stamps from a stamp set called "Going places", from Kraftin´ Kimmie Stamps. De här copic pennorna har jag använt för att färglägga hennes hud och det förvånar mig varje gång att man använder en mörklila för att få till den här hudtonen! These are the copics used to color her skin, and it always amazes me that a dark purple is used to get this skin tone! Today I will share a special thank you card, very unlike my "regular" cards. When making cards I use to mix different, happy bright colors together and add a cute and fun, colored image and top it off with lots of glitter glue. This special card needed to be clean & simple, stylish and beautiful. And once again, my butterfly stamp came to use. I knew that the colors I needed to make this card in were white, gray and gold. A while back I bought this super cool Next Level embossing folder by We R memory keepers, and I had just been waiting for the right occasion to use it, and the result is really stunning! I did use extra amount of double sided tape as I didn´t know how well the embossed paper would attach as it turns multi dimensional. Together with grey card stock and glitter paper in gold I got the look that I wanted. The butterflies are colored with Copic markers in grey and yellowish gold, I added some Wink of Stella, but nearly run out so they didn´t get to be as sparkly as I wanted them to be. On top of that, I added a thick coat of Glossy Accents. I put small squares of foam dots underneath the wings to make them stand out a bit. The sentiment stamp saying "just wanted to say", comes from Gummiapan. Today I have made a card for the clean & simple challenge over at Kraftin´Kimmie Stamps. The stamp I have used for this card is "Brigitte", by Moonlight Whisper and Kraftin´Kimmie Stamps. This clean & simple card has some details, I have added a nice shimmer to the bubbles, using a Wink of Stella in color clear, some banners and glitter along the edges. And I have paper pieced the towels! Love, love, love this simple but very effectful technique! This card was a custom order and sooo much fun to make! It took quite some time to make it, as there were a lot of details and different techniques used. I started out by stamping "Annie the artist", by Moonlight Whisper and Kraftin´Kimmie Stamps, on to a white piece of cardstock. Then I needed to mask the image to be able to make the background using a mini ink blending tool and Distress Inks by Ranger in Tumbled Glass and mowed lawn, As I didn´t have a sheet of masking paper, only post-it on a 1 inch roll I had to do this in pieces... There was a bit of fussy cutting there! After I had peeled the pieces of post-its I were able to start coloring the image, using Copic markers! The hens were the easy part on this card! Stamped, colored, cut out and glued in front of her feet and on to the canvas! The last part was the banner, I really like the banner stamp from the clear stamp set "Soiree" by Mama Elephant! I stamped different sizes and shapes of banner flags on to a few different pattern papers, some more fuzzy cutting and then assembeling the banner!